Coquito is what my folks called Puerto Rican moonshine. And they were not too far off the mark. Coquito is a made at home in the traditional way, mainly for special gatherings. Some people liken coquito to potent homemade eggnog. And it can be very strong, or very mild, depending on how much rum you put into it. In Puerto Rican neighborhoods, the coquito flows during Las Fiestas Patronales, or the Feast of the Patron Saints, and Christmas. Every family has its own recipe. According to my elders, in olden times the success of a shindig was measured on the quality of the family coquito. 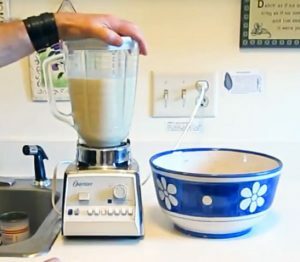 In a Large bowl coconut milk, coconut cream, evaporated milk, condensed milk, cinnamon, egg yolks and rum. Pour in a blender and blend 10-20 seconds. This may done in portions. Pour into sterilized bottles (1 liter or 1 quart). Refrigerate for at least 2 hours. Serve in glasses with a sprinkling of nutmeg or cinnamon. is much potent. It is exclusively a holiday drink.